This map is sectioned and mounted on linen, and folds up into a leatherette cover about 7in by 5in. The printer was McCorquodale and it seems that it was printed about 1904. 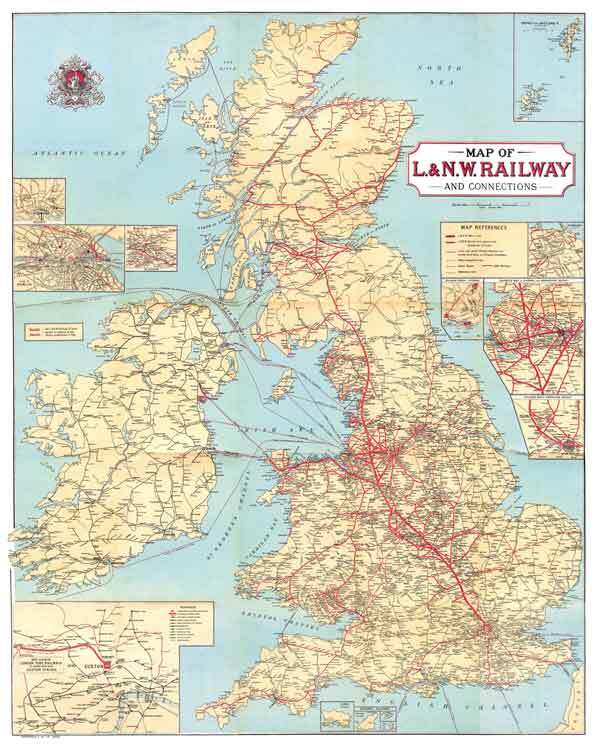 Both Llangynog (Tanat valley extension opened January 1904) and Waterhouses (Leek & Manifold Valley Light Railway and North Staffordshire Summer 1905) are missing from the map but Llanfair Caereinion and Lybster opened in April and July 1903 are included. Therefore this would suggest that the plates were made in the Autumn of 1903. Whatever, it’s a beautiful piece of artwork/printing and it covers the whole of the British Isles – superb! Despite the maps’s age, the condition of the map is excellent and it has proved suitable for reproduction by modern methods. The sections have been scanned, joined together and printed by Amadeus Press on one sheet, 1050mm by 860mm, which in the proper system of measurement used in Mr Webb’s day is about 3ft 5in by 2ft 9in. The map is eminently suitable for framing and putting on the wall in the home of anyone who appreciates the Premier Line and indeed the Pre-Grouping era.